Good morning! I hope you had a wonderful weekend! 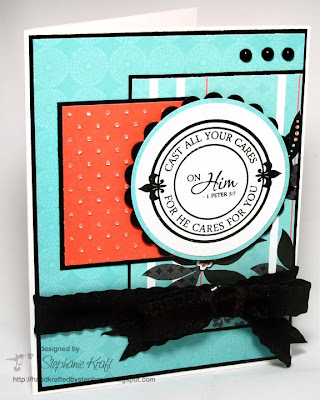 My card for today uses Julee's, Anni-VERVE-sary sketch #4, AVS204. I wasn't able to get the best photo since the day I took this was overcast and a little dreary. Accessories: Circle and Scalloped Circle Nestabilities (Spellbinders), Swiss Dots embossing folder, Cuttlebug (Provo Craft); Mega Circle punch (Marvy), Pearls (Kaisercraft), Faux Suede Ruffled Ribbon (confessionsofaribbonaddict.blogspot.com), Bow Easy, Foam Tape.